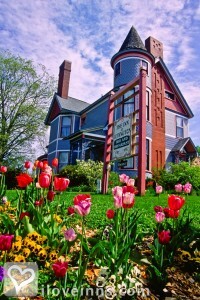 Ludington bed and breakfast travel guide for romantic, historic and adventure b&b's. Browse through the iLoveInns.com database of Ludington, Michigan bed and breakfasts and country inns to find detailed listings that include room rates, special deals and area activities. You can click on the 'check rates and availability' button to contact the innkeeper. There is only one ultimate reason why tourists keep coming back to Ludington, Michigan -- the beautiful lake beaches! Ludington is the home of several historic lighthouses, sandy beaches, and the Ludington State Park that is a piece of heaven for couples and families alike. And whether you are traveling to Ludington for business or for pleasure, you will receive no less than world class hospitality and quality service from the innkeepers of Ludington bed and breakfasts. But what sets Ludington apart for couples is its intriguing appeal to the soon to be wedded. Yes, Ludington is a favorite place of engaged couples to make their vows. Ludington offers several halls, photographers, local caterers, florists, and so on. The sun, and the people at Ludington definitely makes it the perfect place to express eternal love.So if you are planning to announce yours any time soon, make Ludington a part of that wonderful memory.